Climate: Indonesia has a tropical climate and with so much water surrounding its many islands, the temperatures on land remain fairly constant at approximately 28 degrees celcius. There is a dry season (June to October) and a rainy or monsoon season (November to March). The length of day is almost the same the whole year round which means that crops can be grown all year around. Lewis the Lion particularly noticed all of the rice paddy fields there and all of the exotic fruit which he will tell you about it some of his blogs. * Indonesia has one of the highest population densities in the world: the fourth most inhabited country in the world. 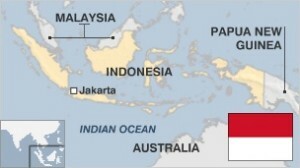 * Located in Southeast Asia, Indonesia is a nation consisting of more than 17,000 islands which divide the Indian and Pacific Oceans and link the continents of Asia and Austalasia. Like in Australia, Lewis the Lion discovered that there was great diving here too! * These islands (achipelago) straddle the Equator and even cross three time zones! * The main islands of Indonesia are Java, Sumatra, Sulawesi (where Lewis the Lion visited), Kalimantan, Papua, Bali and the Moluccas. * It has lots of volcanoes which produces fertile soil for the islands. Together with the humid climate and plentiful rainfall, Indonesia produces lush vegetation and great tropical forestes. (It was no wonder then that Lewis the Lion was reminded very much of his visit to Ecuador when he travelled around Indonesia). * Even though Indonesia is a relatively new nation (it was formed in 1945), it has a rich ancient history that spans back more than a million years ago! Because of the intermingling of lots of different immigrants arriving on the islands over the centuries, there is a rich and diverse culture. Lewis the Lion saw this first hand when he visited the town of Tana Toraja with its unique, funeral festivals and he even met the Sultan of South Sulawesi! Check out his blogs to find out more. * With so many people, is it any wonder that Lewis the Lion discovered that traffic on the roads was crazy. It was each man (or animal) for himself and there was a constant flow of beeping. Check out his blog on his taxi ride to Tana Toraja to find out more.